The following is the unofficial transcript of a FIRST ON CNBC interview with Dallas Fed President Robert Kaplan on CNBC’s “Closing Bell” (M-F 3PM – 5PM) today, Thursday, August 23rd — live from the Jackson Hole Economic Policy Symposium in Jackson Hole, WY. 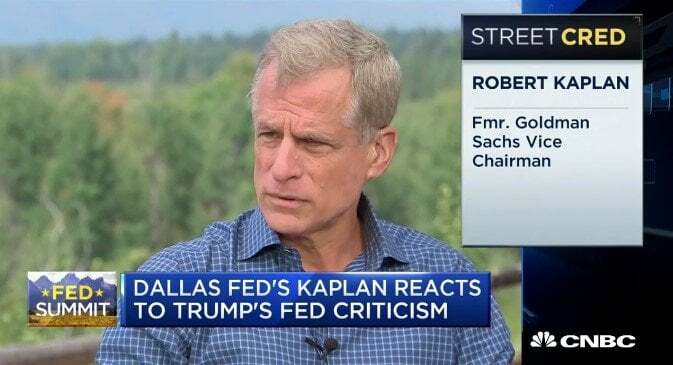 Sara Eisen: let’s get straight to Steve Liesman who is live from the fed summit in Jackson Hole, Wyoming joined by the Dallas Fed president Robert Kaplan for a first on CNBC interview. Steve, take it away. Steve liesman: Sara, thanks very much. Yes, we are kicking off our coverage today of the Jackson hole summit. And joining us now, Robert Kaplan, the Dallas federal reserve president. Thanks for joining us. Robert Kaplan: good to be here, Steve. Liesman: I want to start in a place I’m sure you don’t want to start, but this issue of what the president has said about the federal reserve. He has commented on interest rates, that he’d prefer the fed didn’t hike it. Before you comment on what he actually said, I want to know your thoughts about the president commenting on the federal policy? Kaplan: so I’m not going to comment on what he said. I’m not going to get into that. I would say this, though: our job at the fed is to make decisions on monetary policy and supervision without regard to political considerations or political influence. And I’m confident we’ll continue to do that. And I think that’s probably the only thing I’d say about that. Liesman: do you have concern, though, that it creates political opposition? For example, in the public, I mean, one of the reasons you’ve been so – you talk to the press, you talk to the public, you make speeches. Is it in part because the federal reserve got a bad reputation from the financial crisis, and now the president is criticizing the fed saying you’re working against economic growth, essentially? Kaplan: I think political officials are going to do what they’re going to do, there’s free speech in the united states. I think our job, though, and what we’ll be focused on and what I’m focused on is making good assessments of the U.S. Economy and the global economy, good monetary policy decisions again without regard to political influence or political considerations. And I’m very confident we will continue to do that. Liesman: do you worry at a time -- let’s say there was a close call on raising rates, that it could potentially be seen as bowing to the influence of the president? Kaplan: it’s not going to effect our decisions. How it’s seen, you’ll be a better judge of than I will be but I can tell you around the table at the FOMC, we’ll be striving to meet the standard I just described. Now I’m very confident we’ll continue to do our job in an apolitical way. Liesman: another issue from the white house that affects the federal reserve and policy is the issue of trade and tariffs. Texas, which is the entirety of your district, has a huge relationship with Mexico. What is your assessment so far of the economic effects of tariffs on the outlook? Liesman: if you don’t mind the pun, drill into that. How does the tariffs affect capacity in your business? Kaplan: so we’re producing record levels in the Permian Basin, for example in Texas, and in the united states. But Texas is about 70% of u.S. Production. One of the constraints, though, we have is worker shortages but a bigger constraint is infrastructure. One of those infrastructure issues is pipeline capacity. That takes steel. And with steel tariffs, a number of people in the business have told me they’re concerned with the steel tariffs it will certainly raise the cost of the pipeline infrastructure, it may slow the development of it, and my concern is if there are geopolitical outages from Iran or Venezuela, we need the u.S. To be pumping more to balance the global market. I think it just makes it a little bit harder to do. I would call that a second order effect. I’d say the first order effects -- the direct impact so far in the economy: Texas economic growth is strong. U.S. Economic growth I don’t think has been material effected. I’m watching to see if it widens, though. Liesman: let’s pivot right where you were going which is growth. 4.1% of the second quarter, the current CNBC rapid update has us doing 3% so far in the third quarter. Have you lifted your forecast for this year? Liesman: -- so you’re not as a result of these tax cuts, which are supposed to boost capital investment and boost productivity, you’re not changing your view of potential? Kaplan: I’d like to see potential GDP growth higher. What would do that? -- so far we’ve seen modest improvements from capex. Some of that from my talks with CEOs is moving from next year or the following year to today. I’d like to see more infrastructure spending in the united states. I think we’re about $3 trillion underspent. But the answer is no. And here’s why: the two big drivers of gdp growth in the united states are growth in the workforce, and because we’ve got an aging population, an aging workforce, we think the workforce growth is slowing. And then the second big driver is productivity. Capex would help productivity, but the problem is because educational and skill levels are lagging, we think productivity growth is likely to stay sluggish. Even though it’s going up substantially in a lot of industries. Liesman: so Sara Eisen who unfortunately has to be back in New York has a question for you. Kaplan: yes. Okay. Hi Sara. Eisen: yes, I love it out there, at Jackson Hole. Nice to see you, President Kaplan. I was just wondering if you could zoom in on the U.S. Consumer within this conversation, about broader economic growth. I mean, really surprising strength in some of the retail reports we’ve been seeing this week. After 4% spending in last quarter’s GDP number, how much is it tax cuts and how much staying power does that consumer recovery have? Kaplan: so even before the tax cut the good news about the u.S. Consumer, which is about 70% of the u.S. Economy is the u.S. Households have been deleveraging literally for the last eight or nine years. So if you look at household debt to gdp today it’s – it’s much lower than it was 7 or 8 years ago. And so the consumers got ability to spend, we’ve got a strong job market which further bolsters household ballot sheets and the ability to spend. So we think the consumer is strong and we think the consumer is going to provide a strong underpinning to the u.S. Economy, not just this year but into next year and the following year. So I’m not surprised the u.S. Consumer has been spending. We think u.S. Households are in pretty good shape right now. Michael Santoli: President Kaplan , hoping you could weigh in on this long running debate on Wall Street about the treasury yield curve, about how narrow the spread is between two year yields and ten years and even if you want to go down to three month yields. And in fact 21 basis points now between two tens at the moment. We’ve gone from thinking maybe that’s a worrisome sign to maybe kind of explaining it away. So what is the usefulness of watching this indicator? Kaplan: so I’ll speak as somebody who’s spent his career in the markets for the last 30 years. What the curve tells me on the short end, I think the two-year, for example, is so responding to fed policy and expectation for fed rate hikes. The long end, I think is responding to lots of global liquidity but also it’s telling me that expectations on future growth are somewhat sluggish. And so I think that second point is worth paying attention to. I think it’s consistent, in my view, with U.S. GDP growth tailing off in ’19 and 2020 down toward potential. And I think that’s what the yield curve is saying. So I think the yield curve is worth paying attention to. I think the long end is somewhat depressed by all this global liquidity. But even with that, the shape of the curve tells me that median term outlook is a little bit more sluggish than the short run economic indicators would suggest. Liesman: and for folks at home, Bob Kaplan – Robert Kaplan just wrote an interesting essay with his outlook on growth and this stuff, and so we’re not spending a whole lot of time on it. But I do want to follow up on mike’s question, 20 basis points is not a lot to work with. The next rate hike everybody thinks is coming in September is 25 basis points. Would it stop you from hiking rates if it would invert the curve? Kaplan: and so let me just step back again for your viewers. The feds funds rate is 1.75 to 2%. The one year and the two year are anticipating more rate hikes, which is why those levels are higher. If we raise rates, which I think we ought to be raising rates to get to a neutral level, I think that means we ought to be raising rates three or four times over the next nine to 12 months. If we get for example 2.5% to 2.75%, that’s still below the 280 something number for the ten-year, but it’s starting to get flatter. So it’s something I’ll be watching. And so I’m hopeful we can get to neutral without creating a yield curve. Liesman: Robert Kaplan , Dallas Fed president. Thanks for joining us.